Before long, “photoplays” of several reels’ length were common, and the early storefront nickelodeons gradually gave way to sumptuous moving picture theatres that utilized two or more projectors to provide a continuous presentation. The Hulett Manufacturing Company was a pioneer in the arena of projection booth equipment and the Hulett story illustrates the American ingenuity and entrepreneurial spirit of the early 1900s. This is the story of the E. W. Hulett Manufacturing Company, a firm that designed and manufactured not only reel end alarms, but other booth supplies as well as you will read. The E. W. Hulett Manufacturing Co. was founded by the inventor of the reel alarm, E. W. Hulett, who was himself a motion picture projectionist in Chicago, Illinois. His practical days in projection booths, while motivating his creativity, extracted a toll, as faulty ventilation of carbon arc projection lamps caused his to contract emphysema. When he first became ill, the doctors did not know what was wrong with him. His grandson recalls that one doctor suggested that he go to Florida and essentially retire. He did go to Florida, with his wife and his daughter, Edith, but instead of retiring he opened a gift shop in Miami. They operated the gift shop for three years before he went to John Hopkins and was told that he should have been sent to California instead. The gift shop got sold, and they moved to Southern California. By then the emphysema was causing him great problems. He passed away in January, 1944. His daughter continued to run the manufacturing business after his passing. The Hulett alarms were made with both standard length rod arms for 2,000’ magazines, and with extra deep rod arms for larger capacity magazines. A person could easily change between the two length rod arms if the device was being moved from a standard 2,000’ magazine to one with a larger reel capacity. The early alarms had only the brass rollers. The ball bearing roller was introduced in the late 1940s. Mr. Hulett also invented a changeover shutter mechanism that could be set up in front of the projectors to block the light from one while the second was open. When the operator needed to make a changeover, he could trigger the shutters and one would open simultaneously while the second closed. The shutters were completely mechanical and very fast. However, they did not sell because there was an impression in those days that things had to be “electric” in order to be fast and function well. Of course, double-acting solenoid changeovers were well established by then, but it was Mr. Hulett’s desire to achieve the desired results by a simple design that would not be prone to failure due to complexity or reliance on electric power. Shortly after the reel alarm had been designed and patented, Mr. Hulett realized that sales were going to be dependent upon advertising. He bought (or formed) a small printing company in Chicago to allow him to print the necessary advertisements. That company (PDQ print had excess capacity, and soon was doing printing for other companies. His daughter worked in that company and learned to run all of the various printing machines. The E. W. Hulett Mfg. Co. continued to exist after Mr. Hulett’s death. It produced reel alarms during the major expansions of theaters following both World War II and then the Korean War. What many people in the industry did not know was the fact that Mr. Hulett had died. His daughter, who had been well trained in every facet of the company's operation, continued to run the entire business. If someone tried to call Mr. Hulett, he was simply “not available.” His daughter could handle any problem. She was one of the very few business women in the 1940s and 1950s who was running a company in the motion picture industry. She was also responsible for the only major design change in the reel alarm, the conversion from the original brass roller to a stainless steel ball bearing roller. “I know my grandfather from the stories that my mother has told over the years. She was the one that completely ran the manufacturing company when I was a child. She did everything from design, advertising, bookkeeping, correspondence, ordering parts from subcontractors, quality control, manufacturing, sales, to the end part of wrapping and shipping the alarms. She taught me how to write business letters. She also worked some of the trade shows. My knowledge of the industry (in particular that of showing the films) comes from the "education" that I got growing up while my mother ran the company. I have memories of going into the manufacturing districts of Los Angeles to the machine shops where parts for the alarms were being made. I was a young boy at the time (probably 6 to 8). My mother would walk into these companies and find the machine that was making "her" parts. She would pick up a handful of the parts and walk into the manager's office. The parts would be dumped on the desk, and she would open her purse to get the blueprints and her micrometer. She would then make sure that the parts were being made to the proper specifications. It was relatively unusual for a woman to be able to deal with micrometers, and machine shops in that era. “There was one machine shop in Los Angeles where there was a collection of model railroad engines and rolling stock up on shelves. They were bigger than "O" gauge. My impression is that they were 1/12 scale. I believe that they had been made by one of the machinists. My father had given me an American Flyer electric train for Christmas when I was about 6 or 7. That combined with these beautiful 1/12 scale trains made me interested in model railroading. I still have that love. I don't have either the skill or the machine tools to make the models, but I have acquired a few. I am attaching a photo of a couple of Pacific Electric interurbans that I recently acquired. These are 1/24 scale and run on 45mm track. We run trains around the Christmas tree. “My college education gave me a Bachelor's degree in Chemistry. My career started with me programming computers in the aerospace industry. Eventually I migrated from programming computers to working in software quality assurance on military software. I also worked at times doing technical writing. When I got laid off from Boeing more than ten years ago, I returned to school and got a degree in Electronics Engineering Technology. I can now work with both the hardware and software of computer systems. The reel alarm business died with the advent of platters and Xenon lamps, as theatres were quick to switch from changeover operation to platter operation to save operating costs. Mr. Hulett’s daughter and grandson have kept the assets of his company intact to this day, and were kind enough to sell me a “new in box” reel alarm for my collection. · The “J. C. Automatic Film Indicator and Warner” made in Gary, Indiana, likely manufactured prior to World War II. · The “Jackson's automatic reel-end signal” made by American Theatre Supply Mfg. Co.
· The “Essannay Electric Mfg. Co.” in Chicago. 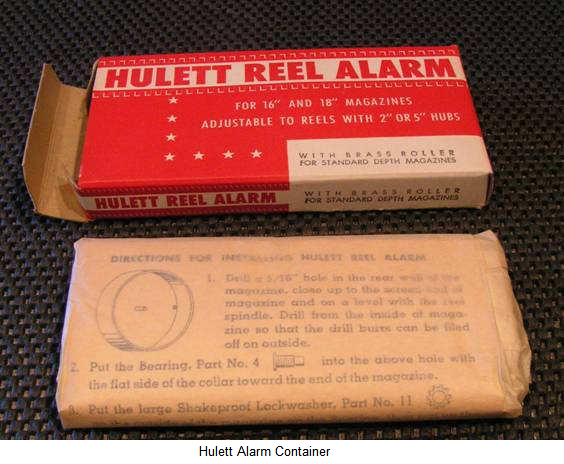 · The “Ace Reel End Alarm” which appeared to be almost a duplicate of the Hulett alarm, except that a chain was added to pull the arm up when the projector case door was opened. · The “Don Canady reel alarm” whose device used a light beam and photoelectric cell to trigger an electric alarm. It was patented on Nov. 27, 1934. · The “Hatke Reel Alarm” make by the C & W Manufacturing Company in Denver, Colorado, that utilized a centrifugal device to sound an alarm bell three times. In addition, countless lesser-known and home-made reel alarms proliferated over the years. Projectionists of the “Golden Age of Cinema,” unlike the multiplex staff folks of today, were mechanically inclined and possessed the skills necessary to maintain the equipment in their charge. Only with the advent of sound did the service engineer concept begin, that owing to the novelty of the emerging field of electronics. I have known projectionists who designed and built extremely clever and reliable devices to “automate” their booths long before the “age of automation” began to suffocate the art of motion picture projection and showmanship. Note that the Hulett and Ace alarms employed an arm with a roller that rode on the film as the supply reel rotated. The small friction bearing roller riding on the film was in contact with the emulsion side of the film, so, if it stopped rotating, emulsion scratches would likely result. The Hulett alarm was later designed with a ball bearing roller to preclude this. However, the “non-contact” alarms took full advantage of their non-contact design, and the “Can’t Scratch” name is evidence of this. 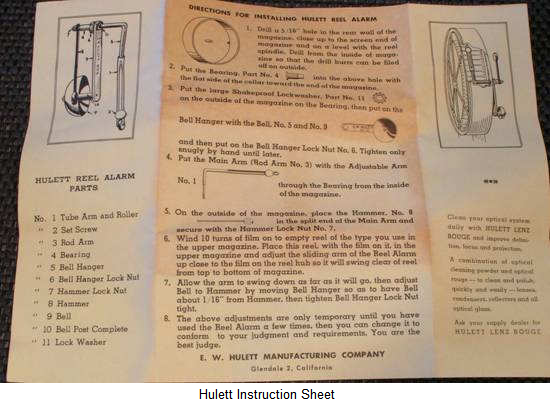 Here follow copies of sales brochures, patent papers, and other information related to the Hulett reel alarm and others. Copy of information sheets found relating to Jackson ("pendulum") alarm.ing) had excess capacity, and soon was doing printing for other companies. His daughter worked in that company and learned to run all of the various printing machines.